On the sixth day of Christmas, my true love gave to me... no geese whatsoever. But here's a gifting recipe for something hot and spicy and you can make – quite easily, in fact. My brother in-law loves pickled jalapeños. I usually make him a couple jars for Christmas. 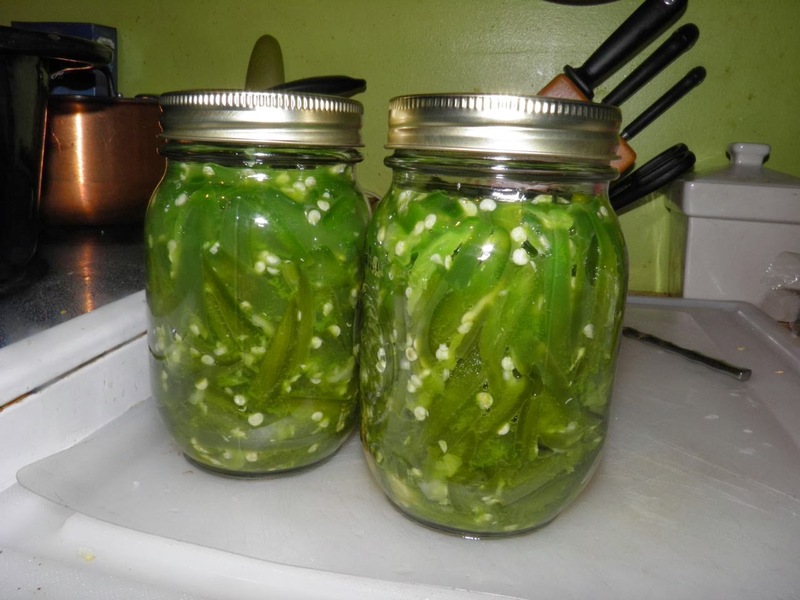 For the last two years he received lacto-fermented jalapeños. Jalapeños and salt – nothing else. He swears they’re the best he’s ever had. Lacto-fermentation is a way of preserving vegetables through the use of healthful bacteria. The most common is lactobacillus. It’s one of the good bacteria in yogurt. To lacto-ferment you extract the natural liquid from whatever you’re dealing with (it can be vegetables, fruit or some meat) by massaging it with salt. The act of massaging breaks down cell walls and liquid is released. In effect, you’re making brine from the juice of whatever it is you’re preserving. In the case of these jalapeños, the liquid was quite green. “Lurid” green, to say the least. After a week the colour toned down a bit to something natural looking. Lactic acid is a natural preservative that inhibits putrefying (rotting) bacteria. Starches and sugars in vegetables and fruits are converted into lactic acid by the many species of lactic-acid-producing bacteria. Lactobacilli are everywhere, present on the surface of all living things and especially on leaves and roots of plants growing in or near the ground. What you’re doing is preserving the peppers for a short time with salt, until the good bacteria have a chance to grow and take over the job of preservation. 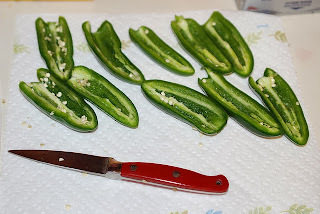 Words to the wise: use gloves when you’re massaging the jalapeño slices. If you have any small cuts on your hands the jalapeño juice will sting terribly. I didn’t have any cuts or abrasions but my hands still burned – after I was done – for an entire night. This was after I had washed my hands with soap and water at least 4 times. So wear gloves. Oddly, jalapeño peppers are relatively cheap to buy. Far less than sweet green or red bell peppers. For anyone who loves Mexican food, these jalapeños will be a most welcome, and unexpected gift. The peppers don't need to be processed in hot water. I was feeling a little "unsure" my first time doing this. 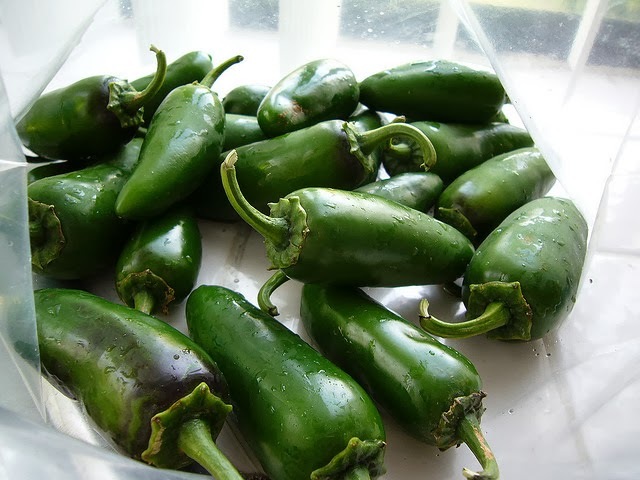 Wash the jalapeños well to remove any surface dirt or chemical spray. Trim off the ends close to the stem. Then cut the jalapeños in long slices with the seeds still in the peppers. Repeat until all the peppers have been sliced. Place the slices in a large bowl. Sprinkle with the 2 tbsp of salt. Put on clean, untreated rubber or latex gloves. Slowly begin to squeeze the slices of jalapeño making sure the salt is well worked into the flesh. As you proceed, you will see green liquid forming in the bottom of the bowl. Continue to massage the slices until they are reduced to about 1/3 their original volume. 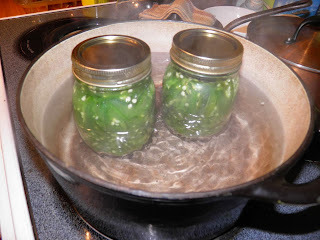 Divide the pepper slices between two sterilized 500 ml mason jars. Tamp the peppers down tightly into the jars. Divide and pour the green brine over the peppers. If the liquid does not come up to cover the slices, mix the remaining salt with the water and top up the jars. They need to be covered. My first time I took an extra step that I probably didn’t need. I processed the jars for 15 minutes in a hot water bath. I was feeling a bit unwary. But everything went well well with the jalapeños. The second time I did them I didn’t process and everything was fine, too. *Purchase the number of jalapeños you reasonably think it will take to fill the jars when sliced. Some jalapeños are heavier than others, so weight isn’t a really accurate measure when purchasing them.